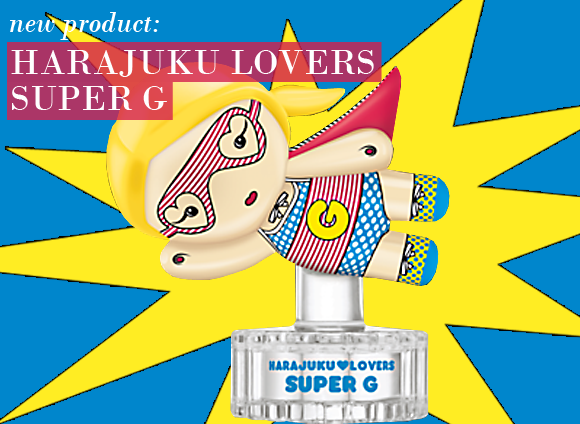 The latest instalment in the Harajuku Lovers saga is the limited edition Super G, a colourful scent with one of the most amazing flacons I have ever seen. A blend of Japanese kawaii and American bravado, Super G is a pop art superhero with cherry red lips and a matching, flowing cape. Her scent is an exotic fruity-floral blend that opens with juicy Tangerine and Pineapple, and a touch of sweetly sharp Cranberry. The heart is decidedly creamier, blending Banana Nectar and Coconut with delicate Yellow Freesia and a touch of ripe Peach. The musky dry down rounds off the composition with Vanilla, Cedarwood and Raspberry, a deliciously fruity scent right through to the very end. If you’re enamoured with the scent too, you’ll have to be quick – she’s a limited edition! My daughters have a number of these perfumes and wanted to buy a couple for their friends birthdays (age 10). Great little starter to the world of fragrance and they have the added feature of the lovely little doll tops. This entry was posted on Thursday, July 21st, 2011 at 9:07 am and is filed under Fragrance, New products. You can follow any responses to this entry through the RSS 2.0 feed. You can skip to the end and leave a response. Pinging is currently not allowed. cutest harajuku lovers fragrance ever! !